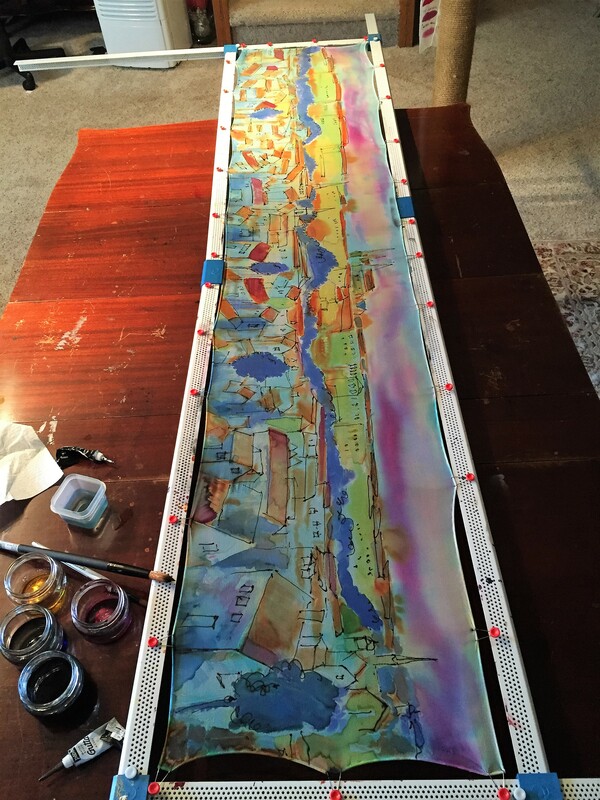 I was recently commissioned to paint a silk scarf as a gift reflective of a trip to Prague. I enjoy hearing stories from clients and their experiences traveling. Almost immediately I had a clear vision of a design from the colorful description given. More often than not I start painting and let the paint colors guide me. I don’t like to over think my designs because it interferes with my creativity. I would rather work out the design on fabric. 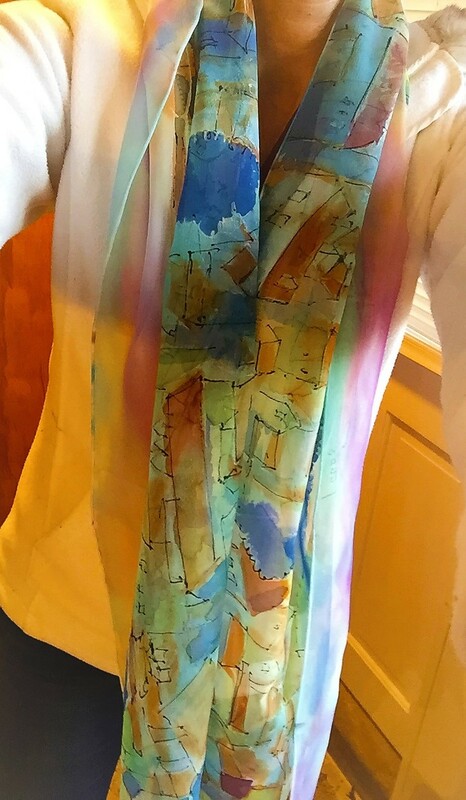 The silk dyes I use from Dharma Trading Company don’t become muddy and dull when mixing more than two together. The molecules remain separate and so color is always clear. Good dye remains pure and I compare it to the color in nature and vibrant orchids. 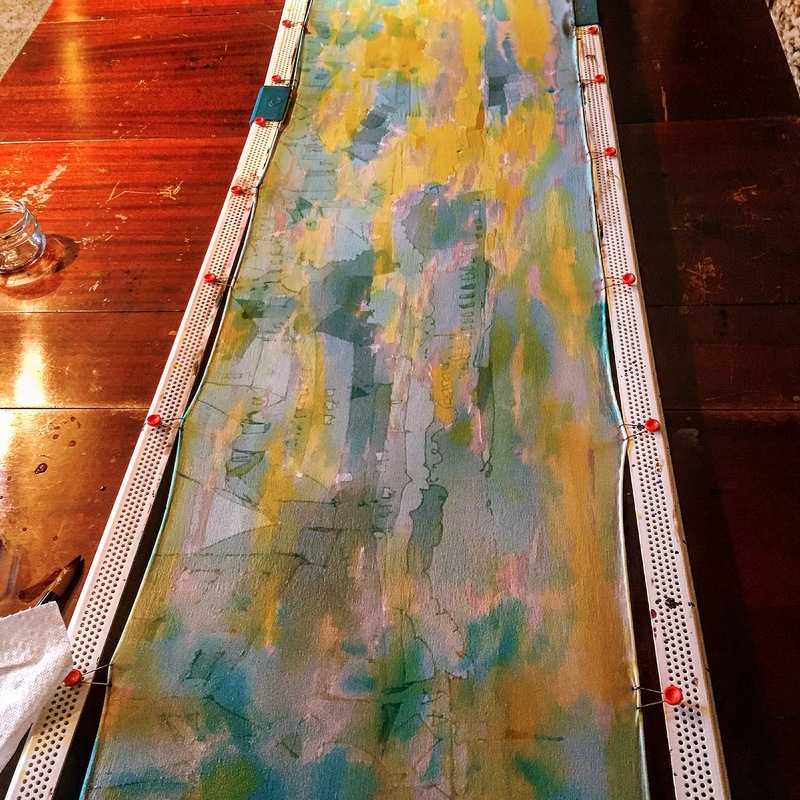 Here are the steps I took in painting this 72″ silk chiffon scarf. First clear resist was applied to layout the design. Next I did a wash much like water color over the entire piece to set a background mood. For the final steps I redrew the design in black gutta and then filled in with custom mixed dyes. I favored warm colors on the rooftops so they would stand out more. After the piece dries for a day, it’s removed from the stretcher, and then taken to the cleaners. E: Lorraine@Lorrainecahill.com © 2019 Lorraine Cahill. All rights reserved.